Yesterday was my big day as a presenter at the Child Action, Inc., “Caring for Children in Stressful Times” conference and it was a wonderful experience. Though it was an adventure getting there (light rail had lost power in the stretch of line that I needed to be on and the bus drivers they used for the replacement bus bridges didn’t seem to know where they should be going), I made it and gave presentations that I hope were in some way valuable to the participants. Unfortunately, I’m still not 100% health wise, so I didn’t feel so hot towards the latter part of the day. By the time I got home I came to the conclusion that the only thing I wanted to eat was soup, and even though I was rewarded well for the event, I still had to fall back on what I had available to me at home because going to the bank was far too big an ordeal. This presented quite the conundrum as I was feeling pretty awful by the time I got home, so I really had to pay attention to what I had available in my kitchen if I wanted to have some decent soup. Fortunately my kitchen cooperated, thanks to ingredients that appear to have gotten together behind my back to make sure they tasted okay when combined. Lately I’ve gotten teased by some friends and family members who say that I should get sick more often because I seem to get more inspired. I don’t know that that’s really the case; I truly believe that I’ve just happened to have some interesting stuff left in my fridge and cupboards that happen to mix well together. Last night I some food math in my head and came up with a fabulous little hybrid of a recipe that I hope everyone will enjoy as much as I did. Preheat oven to 350°. Place the tortilla strips onto a foil lined baking sheet lightly sprayed with cooking spray and bake for about 10 minutes or until they turn golden brown. In the meantime, season the steak with 1/4 t cumin, 1/4 t salt and some ground black pepper and set aside for about 5 minutes. Heat 1 tablespoon of cooking oil in a large pot and add the garlic, cooking it until it begins to turn fragrant. Add the steak and stir fry over medium high heat until it is no longer pink on the outside (about 3 minutes). Add the onion and bell pepper strips along with the remaining salt & spices and sautee for about 1 minute. Add the beans and the diced tomatoes and mix well. Add the broth and bring the soup to a simmer then reduce heat to medium low, simmering for about 5-6 more minutes. While the soup is simmering, remove the baked tortilla strips from the oven and allow to cool slightly. 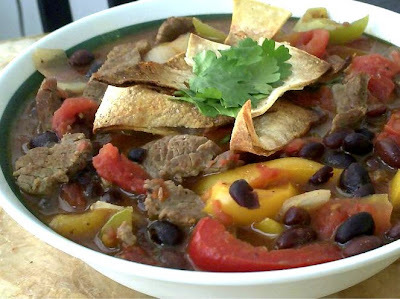 Spoon generous amounts of soup into large bowls or mugs, top with tortilla strips and chopped cilantro, and enjoy! My hubby would love this!!!! We are freaks about Mexican food in this household. I can't wait to try it! What kind of broth? Chicken or Beef? I just made this soup for dinner and let me say it is wonderful! I replaced the cayenne pepper with chili powder because one of my roommates is not fond of spicy food at all. It is delicious! The tortillas on the top are just like the fried..thingys.. with Chinese soup. Soooo good! Oh my goodness, we just made this soup (I am still eating it) and it is AWESOME!! I only had one can of regular black beans, so I added a can of refried black beans too, and it probably made it thicker than your original recipe but still yummy! I don't know how I am just seeing this recipe! I made it tonight and it was so yummy! I used a can of Rotel instead of the diced tomatoes so it was extra spicy. It was a huge hit with family and friends!